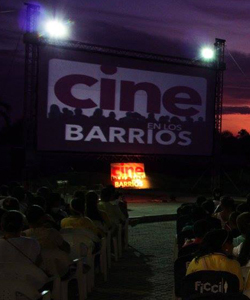 Two years ago, Cine en los Barrios branched out from Cartagena aboard the FICCI Mobile to different towns throughout the Department of Bolívar. This year’s exciting challenge is to reach six more departments in order to continue on with our objective of increasing the active inclusion and participation of certain communities, many of which have never had the opportunity to enjoy the movie theater experience. With this objective in mind, the call for entries has expanded to a national level and a new platform for open content has been established for flmmakers who would like to show their projects on the Cine en los Barrios big screen. Our goal of creating opportunities for integration and inclusion and of turning universities, schools, cultural centers, libraries, prisons and senior centers, etc. into unique movie theaters would not have been possible without the support of important partners such as the Governor’s Offce of Bolívar and Icultur.